Establishing a new performance standard in its class, the Wyse 3020 thin client provides an exceptional user experience at a highly affordable price. It features a dual core ARMADA 1.2GHz System-onChip (SoC) along with a built-in hardware media processor and delivers smooth imagery, bi-directional audio and flash playback performance. The 3020 thin client offers great functionality with support for up to two digital displays, a dual-band WiFi option* and Microsoft RemoteFX certification for high-end graphics. The Wyse 3020 thin client arrives ready to connect to Citrix®, Microsoft®, VMware®, and Dell Wyse vWorkspace right out of the box. It is available in two virus-resistant firmware configurations as a Citrix zero client with Wyse ThinOS Lite, or as a thin client with Wyse ThinOS. IT won't need to visit or touch Wyse 3020 thin clients to manage them as they can be managed remotely with Wyse Device Manager (WDM). WDM offers remote enterprise-wide management that scales as you grow from just a few to tens of thousands of endpoints. One DVI-I port, DVI to VGA (DB-15) adapter included. Native dual digital display support with DVI-I and DVI-D ports. Horizontal stand. The same stand can be used for VESA wall mounting. Questions about the Dell Wyse 3020 T10D Thin Client? We can help. For more information about the Dell Wyse 3020 T10D Thin Client, or any of our products and services, call us at 1.800.457.8499 or email us. 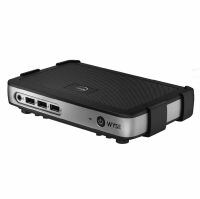 Order your Dell Wyse 3020 T10D Thin Client today. Order your Dell Wyse 3020 T10D Thin Client now. Your purchase order, with credit approval, is welcome, as well as all major credit cards, PayPal and Google Checkout. Remember, you'll get FREE technical service with every product you buy from Vecmar.